If you don’t know the difference then it’s better to reed official documentation or go through my notes. The point is to choose method consciously. Before new service can be created AngularJS should know about this service. Service previously registered by $provide function. The benefit of this function is ability of configure this service in module. app.config() with injected $provide function. Also we can create provider directly from the module object and example of configuration some parameters. Instead of injecting the provide service in config - inject the testServiceProvider. (“Provider” automatically appends the name of the service). 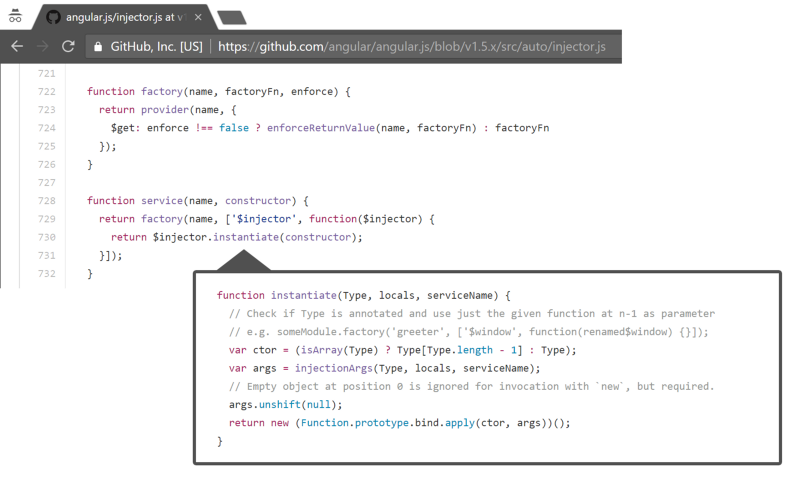 Investigating AngularJS core we can find factory() and service () function. And it looks like just wrappers around provider() function. Example of service can be pretty complicated. I will put here the same server of getting testList as simple as possible (CodePen). Constant service — simply register service with injector. The only of functions here that is not wrapper of provider() function. Constant is good for storing static data and can be injected in module configuration function and can’t be overwritten. Value — is shorthand of factory function. Good for use if you have nothing to inject. Value service can store functions with attributes. Using services in controllers or another services looks the same. We inform injector what services to inject with dependency annotation. It’s better to create service with technique that is better match requirement for service functionality and it’s destination. Provider — when we need to configure it dynamically in config function. Service — when we need to inherit something. Value — when we don’t need any injections and have no dependency. Constant — as a storage of values. It was the main inspiration for this article.